Two bike corridors connecting the city’s southeastern neighborhoods should be safer after crews finish constructing buffered bike lanes on eastern Cesar Chavez Street and a two-way protected bikeway on Cargo Way. 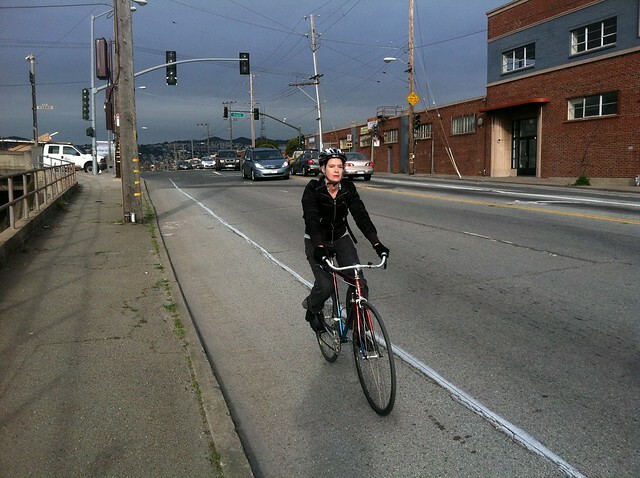 Bike commuters are already enjoying more room on a section of eastern Cesar Chavez, where car parking has been cleared and preliminary striping put on the ground, as shown in photos posted by the SF Bike Coalition yesterday. The SFMTA writes on its Livable Streets Facebook page that the construction is only in its first phase. The plan for the Evans Street intersection, which recently cleared a public hearing, must still be approved by the SFMTA Board of Directors on April 3 before it is implemented. The project will also include green pavement treatments and soft-hit posts separating the bike lanes and will be completed some time in the summer, according to the SFMTA’s latest report [PDF] to the SF Bicycle Advisory Committee. Just to the southeast, crews are building a two-way protected bikeway linking Third Steet to Hunter’s Point and Heron’s Head Park. 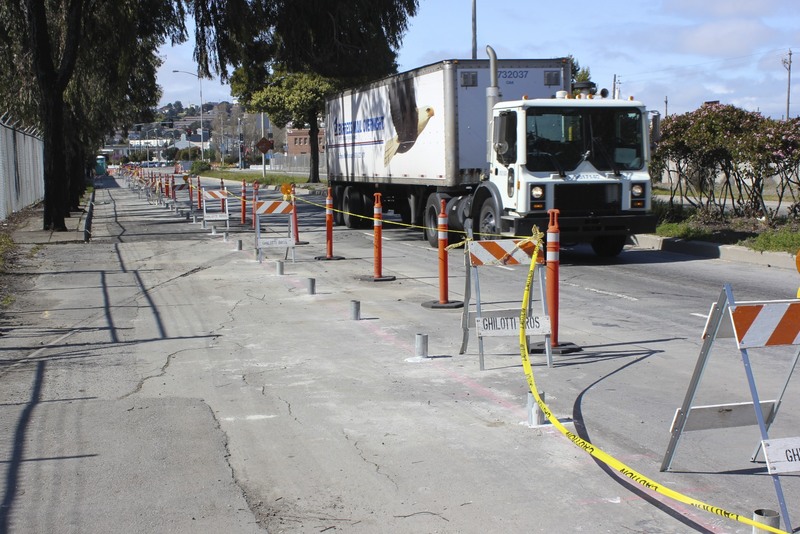 The project, led by the Port of San Francisco, will include a chain-link fence separating the bikeway from motor traffic as well as green pavement treatments and bicycle traffic signals. 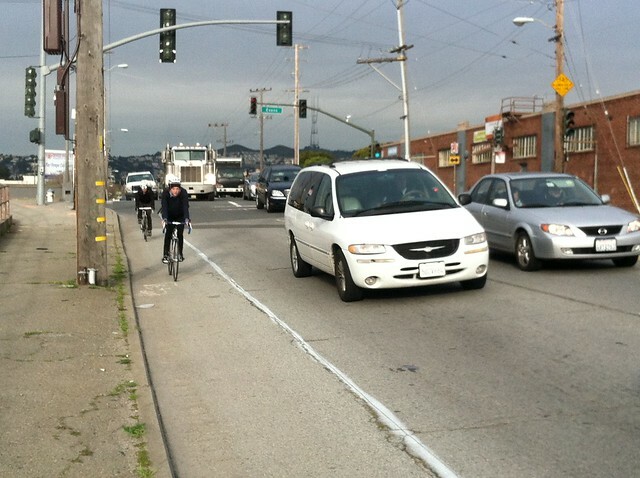 The SFMTA report says the bikeway will be completed in May. Read more about Cargo Way at San Franciscoize, and check out more photos of both projects after the break. 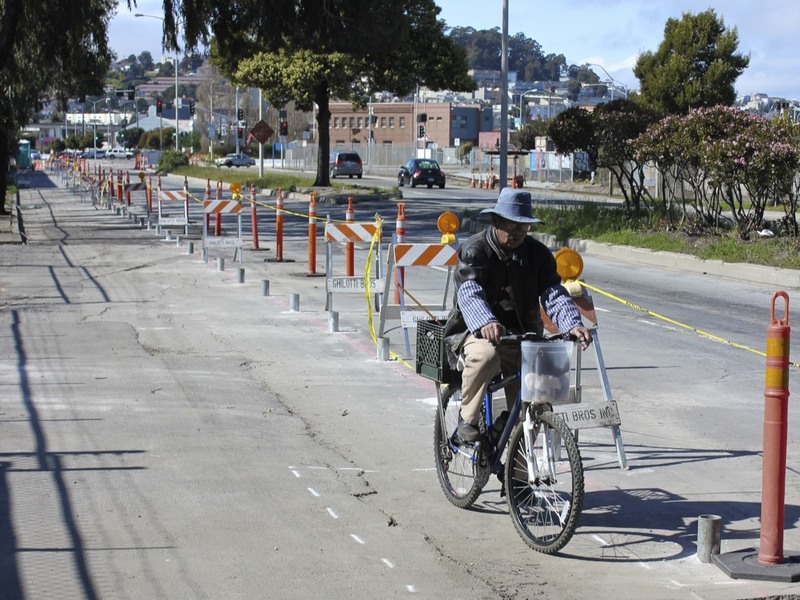 On Cargo Way, "This isn't your typical patch pave job – crews actually grinded away poor pavement and repaved with real asphalt," writes ##http://www.sanfranciscoize.com/2012/03/cargo-way-cycle-track-coming-soon.html##Mark Dreger of San Franciscoize##. Might I say that’s quite a dark sky in the opening shot! Really dramatic dawn – I like it. any samples of what the chain-link fence separated bikeway will look like? There apparently will be a concrete curb/wall running along those cuffs, I’d imagine about as tall as they are. Rebar is going in now. I’d imagine about as tall as they are. Rebar is going in now. So more like a curb. Guess with a fense they couldn’t plant anything in there. Wonder how it will look. I wonder how many people will walk in the bike path since the sidewalk is of such poor quality. I can’t wait to ride these when they’re completed. Finally rode this stretch … wow, much better. Even without all the striping and soft-hit posts, just removing the parked cars is a massive improvement. My only request: just run the street sweeper done each side so we don’t have to ride through so much debris. The striping is down on Chavez from Pennsylvania to almost Evans and from just past Evans to almost 101. No bike lane markers yet but that will follow shortly I assume. The bike lane is very wide. Very different vibe. I have never seen a bicycle in 7 years of commuting on Cargo way where the traffic is 90% US Mail trucks. I am not against bicycles, but if the numbers in this report are correct the Cargo Way bike path is a bad use of funds which are getting harder to come by. What’ s been done so far appears to have cost over one million dollars (phase one). Two hundred and eight thousand went just to remove of what was there before . Phase two demolition is another 182,000 and 839,000 for street improvements. And these are the estimates! So where is the money for all this supposed to come from and how long before there is a registration fee for a bicycle? why would anyone ride their bike on Cargo as it was? With the fixes in, they will come, especially as more development comes to that part of SF. As near as I can tell the money comes from the Port. For the past couple years riding Cargo Way in both directions has been a part of my morning workout. But you’re right about not expecting a lot of bike traffic. As they’ve put in the protected bikeway I’ve been very surprised to see the sheer numbers of bike tracks being left in the dirt. There are other people using it. I noticed street paint laid down very recently to help traffic turning from Mendell to the east to help them avoid the fence. Still a work in progress. Paint is on the ground, mini-stop-signs are posted, but the Planet of the Apes Bikeway on Cargo Way is still technically not open for business. “Road Construction” sign still in the way, but I saw ~ 10 people on Cargo Way this morning. Lanes are striped, stencils of bikes, stop here, etc. are in. Answering my question “what happens at the USPS driveway: Bikes are supposed to stop, and look for traffic turning into the driveway from both directions. I suppose I always was checking my mirror for anything behind me, but having to stop first and yield to traffic turning across my path seems a bit odd. East end of Cargo Way now makes everyone stop, which should help a bit. Previously the 2 vehicle traffic lanes heading east at the end of Cargo Way had no stop and had right of way over the Jennings St traffic which has always had stops. This is a bit of an improvement for bikes (and everyone). Oops, did someone have some trouble making it through there?